In August of 1922, Alfred T. Neal, proprietor of the Royal Hotel, purchased from Judge James Parker a strip of land at Crowe Lake, including the beach and the "Marble Rock" now known as Marble Point. By April of 1923 he had started construction of a dancing Pavilion, complete with a 50 by 30 foot hardwood dance floor, a Delco lighting system and dressing rooms for bathers below. 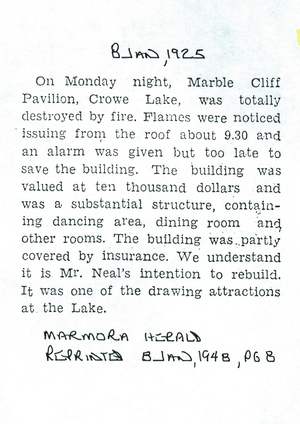 It was known as the MARBLE CLIFF PAVILION. The music for the dancing was furnished by the Myers Orchestra of Toronto, who were so popular they were contracted for the whole season. Wynn Myers was the conductor and violinist; his brother, H. Myers, pianist, and Fred Boland, drummer. Besides the week night dances, a concert is given in the pavilion every Sunday afternoon at 3 o'clock and it is nothing unusual to house over 300 guests at these affairs. Many of the guests at the hotel are lodged in cottages owned by Mr. Neal and situated in a beautiful grove on a high hill overlooking the lake.